Article first published as Book Review: ‘Seeking Father Kahliq’ by William Peace on Blogcritics. In “Seeking Father Khaliq” by William Peace, widowed Philosophy Professor, Kareem al-Busiri, goes through the motions of life, without even realizing that he is isn’t living his life to the fullest. When a mysterious princess shows up and asks him to seek Father Khaliq, he is intrigued. The only thing the professor knows about Father Khaliq is that the princess calls him her father. The princess also informs Kareem that he will be rewarded when her father is found. The search involves pilgrimages to places where Father Khaliq was reported to have been seen. Kareem's experiences on the journey, both good and bad, bring him back to life. He learns a great deal about other belief systems, including Judaism, Christianity, and his own Islamic faith. Along the way, Kareem also opens his heart up to love again. In reality, the pilgrimages are Kareem's journey toward his own spiritual development. The mysterious princess shows up at different times to discuss what he has discovered, and Kareem has no idea that her presence will help guide him through some of the most difficult events of his life. While mainly about his family, the events also involve mid-eastern politics and terrorism. Kareem must sort through what he believes to be true as his willingness to forgive is tested. "Seeking Father Khaliq" by William Peace, tells the incredible tale of one man’s spiritual journey. The author does an amazing job of bringing the story alive for the reader. The pilgrimages are described in vivid detail, as he brings us into Kareem’s mind and soul. The honesty of Kareem’s doubts about his faith is refreshing. Kareem is a good man who has some imperfections, and as he seeks the truth, he becomes an even better person, in spite of the obstacles thrown in his path. I found this novel to be very inspiring. 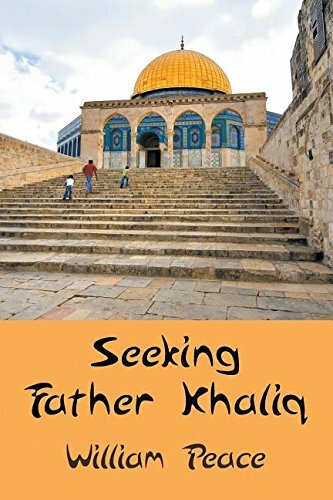 I highly recommend reading “Seeking Father Khaliq,” especially to arm chair travelers who are interested in middle-eastern religion and politics from a spiritual perspective.